Kids Junction Preschool Learning Center’s goal is to have every child’s day filled with learning experiences while meeting the needs of each child’s individual development. We have combined some of the best curriculum to deliver an all-encompassing learning experience. Wisconsin Model Early Learning Standards (WMELS) – WMELS provides us with developmental continuums from which we can create individual goals for the children to help us assess their age-appropriate and milestone development. Assessments & Parent Conferences – We believe that assessing individual progress is the key to planning programs that respond to the needs, interests and abilities of children in any classroom. With ongoing assessment, our teachers can focus on all aspects of a child’s development. At the beginning of the school year curriculum goals and objectives are set in place and throughout the school-year we collect work samples and document facts and skill levels for each child. We assess the children in the fall, winter, and spring using PALs as part of our assessment process and provide a fall conference for parents to meet with their child’s teacher and review their child’s progress. Report cards are electronically available for parents’ viewing two times a year. Play Based Learning – Kids Junction Preschool places a priority on giving children several opportunities for play during the day. Play is central to children’s healthy development and learning during the preschool years. Houghton Mifflin – This Pre-K curriculum is a hands-on, minds-on curriculum that is based on scientific research. Aligned with key Pre-K learning goals, it provides children with the foundational skills they need to succeed as lifelong learners. Handwriting Without Tears – Uses multi-sensory techniques for letter building and recognition to teach handwriting to children of every age. Instruction begins by first introducing and reinforcing the pincer grip (proper grip for holding a writing utensil) before moving into letter formation. Handwriting Without Tears also uses Mat Man to help reinforce the child’s self-image and portrait. Writing Process – The children learn the steps to creating and writing stories; starting with brainstorming topics to write about and moving into illustrating one page stories. By the end of the school year, children are illustrating and dictating three page stories. Music Class (special) – The children participate weekly with a professional music teacher. She brings the love of learning and music together. At Christmas time and in the spring children show off their musical talents. We put on a special program in which the children perform a musical program for parents, grandparents and friends. Art Class (special) – Once a week the children explore the world of art with our Art Teacher. They learn about value, space, form, line, shapes, and mixing colors using a wide variety of materials such as liquid water color and tempera paints, collage materials, oil pastels etc. The children also do artist studies in which they learn the techniques of a famous artist and, through process orientated art, make their own version of one of that artist’s famous works. The children are encouraged to try and do their best. All art is beautiful no matter how abstract it may be. Social Studies – The scope and sequence begins by learning “All About Me” and continues to expand out to the formation of friends and bonds with other children. It also involves learning how the decision making process works in a group setting. It covers development of social skills, personal responsibility, sharing, cooperation, dealing with emotions, accepting differences between people, and learning a sense of community and responsibility to the community. Literacy and Language – Through storytelling, finger plays sign language and child/teacher interaction children will begin to develop their language skills through repetition and conversation. These are crucial tools to give children the opportunity to express themselves using language. Early Math – Is incorporated daily into our curriculum. Math helps children make sense of the world around them, develops reasoning and problem-solving skills. Math activities include learning how to count, sorting toys or snacks, recognizing patterns, or learning how to graph favorites. Second Step – Second Step is a social emotional curriculum used in the 4k classrooms with weekly themes that teach children about topics such as sharing, feelings, listening, and helping others. PASS – PASS is a comprehensive and explicit phonological awareness curriculum that is designed for preschoolers. PASS consists of three different instructional units, Rhyming, Blending, and Segmentation. PASS is taught two times per week in small and large group settings. Trees for Tomorrow; 4K Focus Adopt a Tree – The class chooses a tree using personal investigation and observation. We follow the tree, drawing pictures and journaling throughout the school year. We use the what we know, what we want to know, and what we have learned about charts to explore the tree. We also use sight, sound, smell, and touch to explore our findings. Science – Kids Junction science is taught through observation and hands-on experiments. The children explore the world around them using cause and effect experiments. They discover texture, explore with their five senses, chart observations, and do lots of measuring during cooking experiments. Children also learn to care for living things in their environment. Music and Movement – Music and movement takes place throughout the day. It is an integral part of circle time, transitions, free play and storytelling. It enhances language development, rhyming, hand-eye coordination, musical tones and the introduction of simple instruments bring a smile to every child as they create their own music. Music (Special) – Music is a language everyone speaks and Music and More takes your child on an adventure in music. We travel through the world of dance, instruments, finger plays, rhymes, an rhythms. Puppets and stories visit our imagination during each class. With your child we celebrate with songs that continue to sing in our souls for a lifetime! Crafts – Crafts are hands-on activities that expand imaginations and exercises creativity. It is incorporated on a daily basis into the classroom lesson plan. Whether it is painting with hands, puffy paint, or drawing a picture of an apple. Children learn that all of their creations are pieces of beauty. 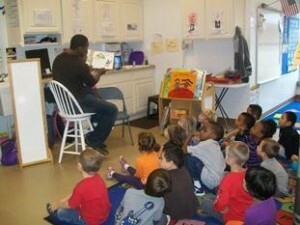 Programs and Events – Kids Junction Preschool loves to showcase our children. We have a performance every school year in the winter and a graduation for children 2 years and older. There are also other classroom events to participate in such as Grandparents/Family Week, holiday parties, etc. In addition our classrooms are always open to parents for a classroom visit, storytelling or sharing a family tradition.